Assuming Thales sort out the problem with people having 60+ms on 17a of course. And that is high. Most people seem to be in the Sub 15ms! I've been meaning to ask, do you live in South Yorkshire or further south? As those kind of ping times traditionally were seen in the London area only on ADSL and I'm not really upto speed on what FTTC is capable over the country yet. Yeah, your pings look great on the BT connection and fall in line with what I would expect from Fibre. When I had the pleasure of maintaining some game servers hosted at Plusnet for a friend who worked there. 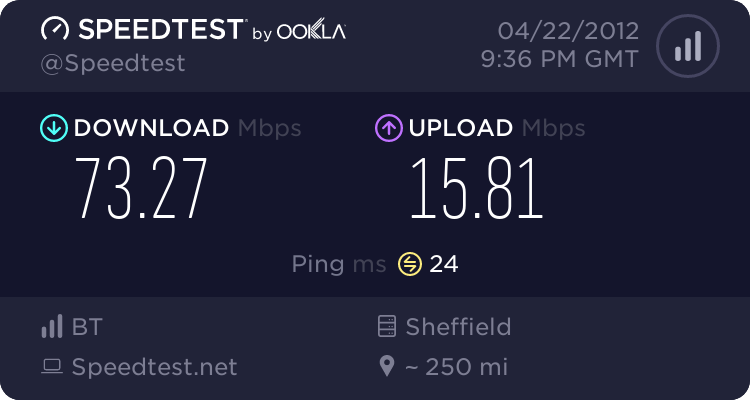 The ping times to London from Sheffield were about 6-7ms. So seeing people on DR with such high latency when BT have their equipment set up properly is disappointing. Its literally my biggest disappointment about being on the network, as a difference of 20ms is easily noticeable in web page loading speed IMO. Its not a deal breaker, but its sad to see it comparing poorly with Infinity. On the other hand I am already seeing reports of people having terrible performance from Infinity at peak time. I can't say I have noticed any difference at all on Origin at different times, other than the fact YouTube itself get overloaded sometimes at peak time and the speed test sites seem oddly unreliable. Especially the thinkbroadband speed test which 95% of the time doesn't work at all and when it does refuses to measure above about 20Mbit for me. The most attractive thing about the DR network is it being truly unlimited. When it comes to pricing BT is taking them to the cleaners as they can soak up things like setup costs etc as monopoly leader. While I really can't afford to move onto FTTC right now, I think the latency issue is preventing me from moving any time soon. If DR was able to provide similar latency within a few ms of the Infinity product I'd probably be jumping all over it right now. But it isn't and so I wait until something changes. Which also emphasises a point earlier, that the number of hops your connection "appears" to take has very little importance in the great scheme of things. Something seems to have been happening to my service over the last couple of days. I've had quite a few brief disconnections around midnight and now my ping times for the first remote hop are down to 19 ms, which is almost 50% faster than normal. However, my download speeds appear to have dropped as a result. Has anyone else experienced this? I'm connected to the Wadsley Bridge exchange. I'll reboot my kit over the weekend and see if anything changes.